•	Uses a managerial perspective and presents management-related dilemmas to help students build critical-thinking and decision-making skills. 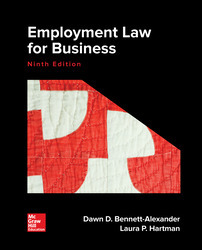 •	Offers carefully selected excerpted case studies to highlight key employment laws and strengthen managerial liability-avoidance skills. •	Features Connect, an easy-to-use homework and learning management solution that embeds learning science and award-winning adaptive tools to improve student results.